Whiskey a ChoCho: Old Overholt Rye Whiskey, Fernet Branca, Carparno Antica, Chocolate Essence, and Bitters. Served with Valrhona Chocolate and Vanilla infused salt. Normally a chocolate cocktail would be too sickly sweet for me, falling more into the Nesquik with a kick category than the handcrafted style of cocktail I’m after. But the Whiskey a ChoCho came with instructions, just dip the piece of chocolate in the Maldon sea salt, and – depending on if you’re using dark or milk chocolate – the cocktail will taste differently. It was very tasty. The rye, bitters and chocolate all danced across my tongue. I shook the hand of the bartender and vowed to recreate it when I returned to San Francisco. Since this cocktail was the final push toward making this blog happen, it’s only right that the inaugural blog post is about the search to recreate it. First step, vanilla infused sea salt. 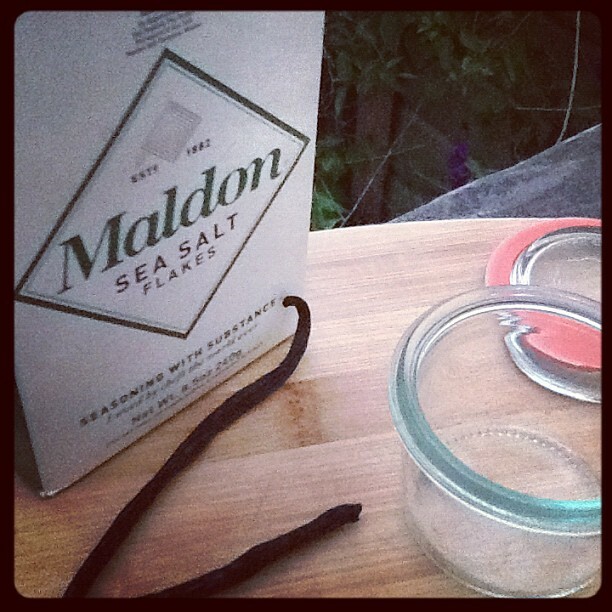 I learned at Pint+Jigger that they used Maldon’s salt and found a super simple recipe on PrincessTofu, which is basically “add vanilla bean to salt, let sit for a few days”. Step one: done. Will check back in a few days with DYI cocktail recipe attempts. The vanilla salt rim, even though non-traditional, is a great way to increase perceived sweetness. Just using the aroma of vanilla has been scientifically proven to make people believe their drink is sweeter than it actually is. How are you? Hope your honeymoon was a great time here in Hawaii. Wanted to reach out to you and offer the recipe to the cocktail that you tried at Pint and Jigger. I just stumbled across your blog and was surprised to find my cocktail! Please feel free to hit me up if you want the recipe and the simple directions for the vanilla infused Maldon that I came up with. You can share the recipe with your followers if you like. Really happy that you enjoyed the cocktail and Pint and Jigger.